This is in response to the correction in cement prices, especially in south India and some parts of north India. According to an analyst, prices have corrected by 9-10% in south India and eastern Uttar Pradesh. Overall, cement demand has been steady across the country and has even grown strongly in some pockets. In August, for instance, cement demand rose by around 17%, higher than the 10% growth in July and the 14% in June. The decent growth in demand has in a way delayed the correction in cement prices. The industry is expected to add 114 million tonnes in installed capacity in the four-year period between April 2007 and March 2011, according to Citigroup research. Graphics: Ahmed Raza Khan / Mint. But capacity continues to come on stream and the proportion of surplus capacity is expected to be much higher by the end of this year and increase further in fiscal year 2010-11. This would dramatically change the profitability of cement firms, which have been enjoying the benefits of high prices and low costs. The current round of cement price cuts may just be the beginning of a broad correction in prices. Analysts at Ambit Research point out in a recent note, “In our view the cement cycle has peaked with an anticipated capacity increase by 23% in FY09-11 relative to increase in demand of 10% compound annual growth rate during the same period. This is expected to put pressure on cement prices, which in turn, is expected to lead to a decline in earnings." Citigroup reiterated in a report dated 27 July that it sees the current fiscal year as a peak in terms of earnings for cement firms and that it expects a sharp fall in the next fiscal year. Cement stocks don’t reflect all this and investors seem to be waiting for the above prognosis to get reflected in these companies’ reported numbers. 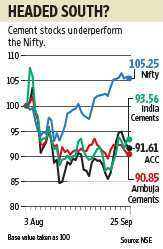 As a result, some cement stocks offer a good opportunity to go short on the market.